I always wanted to like Kanon (of which I’ve only seen the original 2002 edition) ever since I heard Fred Gallagher rave about it over at Megatokyo. I also really wanted to like Air, and I recognized its ambition throughout. But I have a problem: not only am I non-plussed at best by moe, I usually found the characters in Key titles to have insufficient development for me to care about their plight. And the stories of the girls was always about a plight, all right: illness or hospitalization usually being the number one choice, or being a reincarnation of a ghost, or both. The Fuko arc doesn’t seem any different at first. 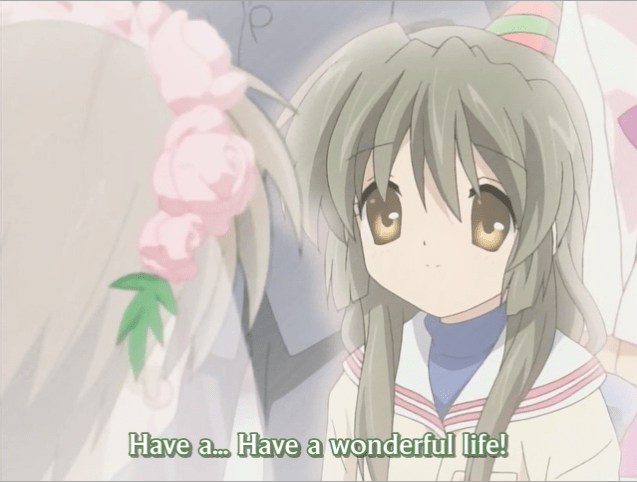 In fact, it seemed like a cookie-cutter replay of the Ayu arc in Kanon, complete with the real girl being in a hospital. What I didn’t expect was, for one, the time that the storytellers spent to help us get from seeing Fuko as an annoyance–and what an annoyance she was at first!–to tolerable to someone who had a family and a past and was worth caring about. She is no Honey and Clover character, to be sure. We are not talking about first-class drama, even at its best. But the thing too is that she is not just the only one. There’s Nagisa and Tomoya, especially Tomoya, and while he has settled back into his comfortable Prankster Helper of Girls role in the more recent episodes he provided both emotional restraint and ballast to prevent scenes from becoming too maudlin. Owen has written articulately and in better detail than me about this matter. Plus, more to my liking, the theme of memory and forgetting was beautifully integrated without being obscure, or overly obvious. It was (mostly) shown, not told. The effect is to make the inevitable bittersweet ending of the arc feel more genuinely emotional than any other Key story to date. (And yes, I include the end of the Misuzu arc in Air. Sorry, Air fans. Sometimes it came close, I admit, but still didn’t do it for me.) One need not cry–I didn’t–to really appreciate the distance Key has traveled in order to get to this point. They had to suppress their usual urge to juice up the scene with soaring music or with extravagant sobbing. They had to consciously build up to this moment rather than spring it on you, especially with the starfish. A lot of the added power too comes from the theme of family that runs throughout, which is also a step forward for anime in general toward creating more believable characters. So, while it doesn’t transcend its genre the way ef-a tale of memories does, the final moments of Clannad episode 9 are an example of this genre at its best. It’s definitely one of the triumphs of the year. I think for me why CLANNAD is getting the nod over its other Key predecessors is that CLANNAD does a better job of intermingling the character development. Even with Tomoya as the center perspective from which the audience views, you get this aura that all main characters are collectively growing. It seems like CLANNAD will less likely drop one disconnected character arc after another like AIR and Kanon did. It’s also a bit unfair to compare this to ef in whether either transcends its genre or not. Because ef is shorter, the ramp up to its climax had to be quicker and more impressionable. CLANNAD can simply control its pace with quality episodes and it didn’t have to put out everything for the Fuko arc. Nonetheless, I’m looking forward to the end of ef and the next few plot arcs from CLANNAD. I’m an ABC participant too!! @koneko-chan: I agree with your assessment of Clannad. For once the characters actually seem to be heading somewhere; they’re not just ciphers for the player of the game or a collection of moe charm points and/or fetishes. The disconnected feeling of Air was my biggest problem with it, and it blunted whatever emotional weight the last arc with Misuzu might have had for me. I think that ef transcends the genre primarily by breaking so many conventions both visually and in the way it tells its story. It really reminds me of the way Eva broke the boundaries of the giant robot genre and forever changed it; I do concede though that Clannad has plenty of time to try something daring and new. So far I see primarily a refinement and polishing of the formula to the point where it actually works. @DS: Doh! Apologies. You’re added now. I copied and pasted the list from the mailing list I think (or someone’s website) and for some reason you weren’t on there…in future posts I’m going to be linking to individual posts rather than people’s websites too. I’ve been lazy lately. Sorry! That sums up Fuuko’s arc for me. The fact that it affected me at all took my by surprise – I know it didn’t resonate with everyone (Epic Win make a well-explained case for the counter-argument) but I was genuinely moved by it. I’m still holding onto my theory that the series is fundamentally centred around the Tomoya/Nagisa relationship so I view Fuuko’s own part as being one of what I’m guessing will be several helping hands in getting the two of them together. I’m still clueless about that girl and the robot in the pre-credit scenes at the beginning of some of the episodes though. @Crisu: you’ve been added to the latest list, with individual link to the most recent post, too. @Martin: I suspect the girl and the robot is Nagisa’s inner life or imagination. Despite her loving family she appears to have her own issues. Thanks! You rock. I probably should do direct-links to Day posts, too, but that’s a lot of work. ^^; And not everybody posts at the same time. But kudos and starfish to you! As for an actual reply, I agree that ep9 was a triumph. All the way up to the middle of ep8, I was seeing a lot of funny gags intermixed with the seriousness. There were instances in ep 7 and 8 that I wanted to cry but didn’t, because a comedy scene came up and lightened the mood. Maybe that was on purpose, just to save all those pent-up tears for the very end, where in ep9 there was very little comedy. And KyoAni went all out on your emotions. Much like how Lucky Star 22 was a refreshing surprise. I cried over Kanata, but then felt awkward when the episode had to end its final 90 seconds with a funny scene about YutakaxMinami. ^^; But that’s Lucky Star anyway. I think I should have cried over Misuzu, but AIR was just so darn -confusing-. When that moment happened, I was like, “No, she didn’t.” And then, oh, she did. And I already missed the cue to cry. You should watch Kanon 2006, though, since the story was told differently from 2002 as I hear (I haven’t watched it nor Kazahana yet x.x).